Following emancipation in 1865, former slaves across the South detached themselves from white-controlled congregations and established independent churches. In Fort Worth, Texas, historic Mt. Gilead Baptist Church was one of those new congregations. Over time it would serve the spiritual and cultural needs of African Americans in the city. Mt. Gilead Baptist Church is the oldest continuously operating African-American Baptist Church in Fort Worth. 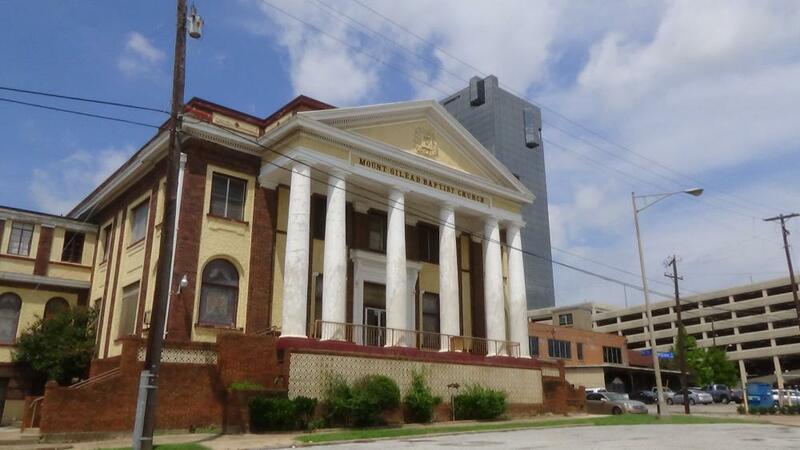 It was organized in September 1875 by twelve former slaves who later built a modest structure in a black settlement called “Baptist Hill” near present-day 15th and Crump Streets. Considered the “mother church of Fort Worth black Baptists,” it soon became a symbol of African American self-determination. Once classified a megachurch in the 1920s because of its huge congregation and local influence, today the church sits as a reminder of what was once a vibrant black business district in downtown Fort Worth. Scholarly pastors promoted progress and taught self-reliance from the pulpit, and these messages resonated with the congregation. Notably, Rev. S.H. Smith (1881-1887) built a second structure at 13th Avenue and Jones Streets in 1882-1883; Rev. A.L. Boone (1916-1923) installed stained glass windows and the dome visible today in existing structure at 5th and Grove Streets; and Rev. Cedric Britt (1979-2009) at age 26 was the youngest to be called pastor and the longest-tenured with 30 years of service at his time of death in 2009. By 1913, Mt. Gilead entered the new sanctuary, designed by black architect Wallace Rayfield and adorned with a pipe organ, elaborate opera chairs in the balcony, and “the first indoor baptismal” in Texas. It had a library with law books, a day nursery for working mothers, and a kindergarten. The basement was furnished with a cafeteria serving signature dishes, a gym, and the only indoor pool in the city where black children could swim. The auditorium was the venue for social events, including a performance by contralto Marian Anderson in 1939. Although Mt. Gilead has seen declining membership over the last few decades, setbacks in the efforts to restore the building, and a scheme in 2016 to sell the church property to help expand the downtown Fort Worth business district, which the congregation defeated in a lawsuit, the church still stands at its 1913 location, a local landmark that remains a formidable icon in Ft. Worth. Joyce Britt, (Telephone interview, July 10, 2017); Carol Rourke, Fort Worth Then and Now (Fort Worth: Texas Christian University Press, 2001); Reby Cary, The Hurdles: Historic Black Icons in Fort Worth and Tarrant County, (Fort Worth: Gail Osborn Graphic Design Publisher, 2016); Mitch Mitchell, “Not For Sale: Aging Church no Longer on Market,” Star Telegram, September 13, 2016; http://www.star-telegram.com/news/local/community/fort-worth/article101616492.html, Les Crocker, The Tarrant County Historical Journal, 2014. http://tchj.com/category/downtown-historic-churches/.